Gourmet vegetarians and even meat-lovers find food paradise here. 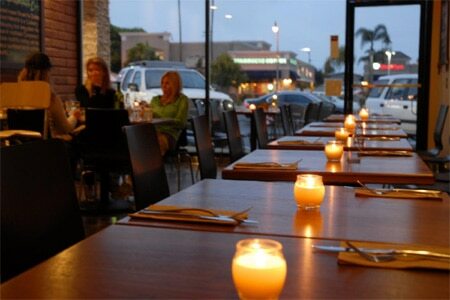 : Located in a strip mall off hip 17th Street in Costa Mesa, this small space packs a punch when it comes to local, organic and seasonal ingredients; Mediterranean-inspired dishes; and refreshing cocktails, wines and microbrews. If you are in a hurry, the cold deli items are ready-to-go treats for lunch, dinner and dessert. Some come to order up a “sampler” of these, like an Italian-esque pasta with tofu or a corn-and-cheddar macaroni option. Some come to Avanti for the pizzas, which are handmade and feature the likes of organic mozzarella, South Coast Farms basil and cold-pressed olive oil from Greece or Italy. Others looking to kick-start their day drop by for breakfast plates like cranberry and walnut french toast prepared in a light coconut batter. We also recommend the daily selection of pies, cakes and cookies made by chef Tanya Fuqua, which generally tend to reflect seasonal fruits and classic American and European concepts transformed into healthy after-meal treats. When the weather turns warm, eat in or take out the seasonal ice creams and sorbets such as blackberry-balsamic or pineapple-chocolate.